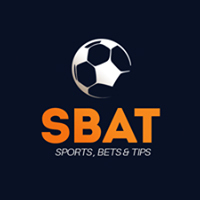 Trip to Stafford Rangers this weekend! After a 2-1 home win against Kidderminster Harriers on Tuesday night, we have a brief break from Vanarama National League North action, as attention turns to the Emirates FA Cup. Having exited at the first hurdle during the last two seasons, it is vital that we make progress this time around. We have been handed an away tie at Stafford Rangers, which Manager Andy Morrell described as "Tricky, but winnable." Morrell added "“We have to go there and do a job. They have a few of our ex-players in their squad as well in Kai Davis and Louis Briscoe so that will add more interest to it." With loanee 'Keeper Shaun Rowley ineligible, Dan Jezeph is set to make his first competitive start of the season. Reece Styche is awaiting news from a specialist following a facial injury sustained against Brackley Town and remains doubtful, while the game may also come too soon for Brandon Fox. 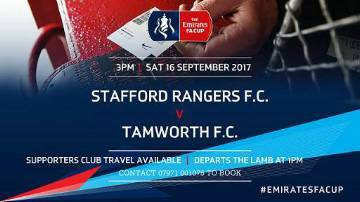 As always Tamworth FC Supporters Club will be running a coach to the game, which departs from The Lamb at 1.00pm.